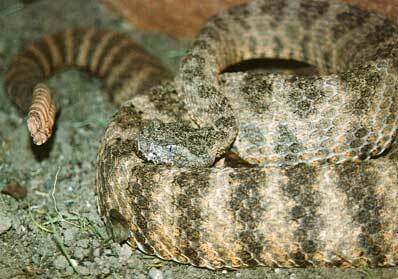 The Tiger Rattlesnake is found only in rocky canyons, hillsides and ravines in deserts or grasslands and are most active after rains. They are nocturnal and begin foraging when the sun goes down. They occur in isolated populations through most of Sonora, Mexico northward to south-central Arizona. They are recognized as having a small head and proportionately large rattle. The average adult size is between 24 and 30 inches, rarely exceeding three feet. Compared with other North American rattlesnakes, very little is known about the behavior, reproduction and ecology of the Tiger Rattlesnake. Perhaps it will be the work of the young herpetologist to examine the Tiger Rattlesnake more closely.